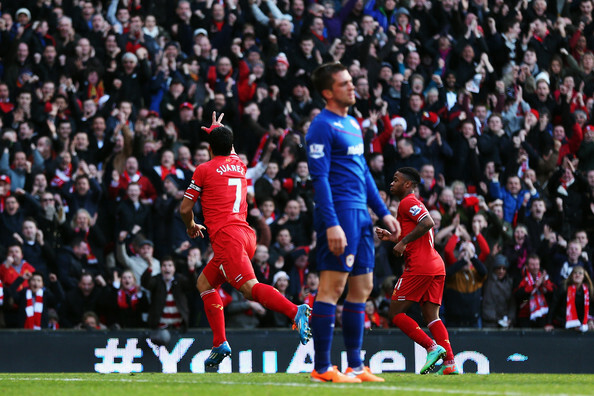 The amazing run of Liverpool, led by Luis Suarez, continues. A 3-1 win at Anfield over the torn Cardiff not only puts the club on top of the Premier League for the time being, but also makes the Uruguayan the top goalscorer in Europe for now, also providing the assist to Raheem Sterling’s goal. The second half made the match seem a bit closer than it actually was, as Liverpool stormed the pitch for the first 44 minutes, constantly finding themselves in the box for excellent chances coming from Suarez, Coutinho and Sterling until the very deep line Cardiff started out with was broken, making it quite a landslide through the first 45 minutes. Jordan Henderson was the one who provided the assist to Suarez on the first goal, hitting a shot from outside the box, and Henderson, with a cheeky little back flip was the one who provided the assist to Suarez on the third goal, before the Uruguayan beautifully curled it into the corner. The second goal, in between the Suarez strikers, was an example of how badly Cardiff were defending in the first half, especially when they tried opening up to attack, with Suarez, Coutinho and the scorer, Sterling, alone in front of David Marshall. Simon Mignolet had one excellent save early in the match, but could have done better in the second when an uncovered Jordon Mutch made things slightly tense through a headed goal, his third of the season. Cardiff began looking a bit more comfortable through the wings, mostly trying to generate chances by crossing into the box. Martin Skrtel was grabbing and shoving quite a lot, but got away with it for the most part, clearing most of the dangers. As the match was nearing its final point, Liverpool made the most of Cardiff leaving plenty of space behind their defenders, but Suarez and Sterling both missed comfortable chances that could have made it another very impressive scoreline for the Reds, who have at least a couple of days at the top of the table.